The item Batman/Superman [vol. 3] : Second chance, Issue 10-15, Greg Pak, Jeff Lemire, writers ; Jae Lee, Karl Kerschl, Marc Deering, Diogenes Neves [and ten others], artists ; Gabe Eltaeb and [four others], colorists ; Rob Leigh, letterer ; Jae Lee with June Chung, collection cover artists, (electronic resource) represents a specific, individual, material embodiment of a distinct intellectual or artistic creation found in Sno-Isle Libraries. Batman and Superman: the two greatest heroes the world has ever known. Surely, together, there's no menace they can't face. A microscopic planet so small it can float in a person's veins. A Doomsday-infected Superman. A time-traveling chaos demon. The onslaught of threats is putting the pressure on the world's finest. But when a rescue mission goes wrong, both heroes awake as blank slates, all memory erased. Now Gotham City is faced with a Superman without his moral compass and a Batman without his vendetta. Without the two super heroes to rely on, who remains to remind them who they truly are? 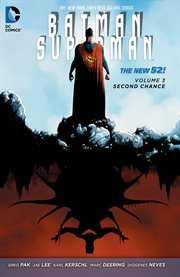 In Batman/Superman: Second Chance, acclaimed writer Greg Pak (Action Comics) and a bevy of comics' best artists including Jae Lee, Karl Kerschl, Marc Deering and Diogenes Neves set Batman and Superman on a collision course... but will either hero emerge unscathed?